There isn't much technical data given with this program, I hope someone out here can help. I installed WordPress blog on my own domain and want to use my Life Journal to Blog. I host with Godaddy. I've tried what I think as every potential way to put in the URL & Page in the advanced settings besides port username and password, and when I test the connection it always fails. 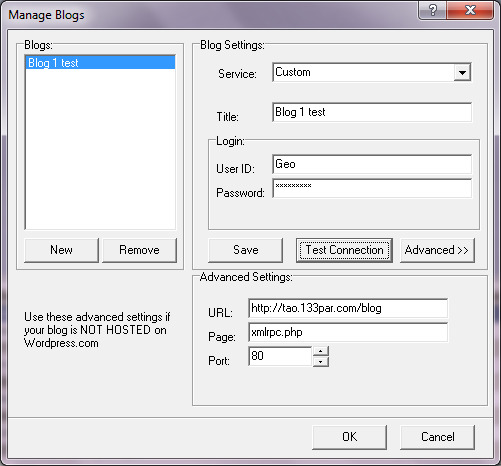 Now I can use the same URL in a web browser I use in the Advanced Setup and it shows successful for taking posts, pointing to the xmlrpc.php page, but with Life Journal it cannot connect. here is a screen shot of my setup, can you see any problems?